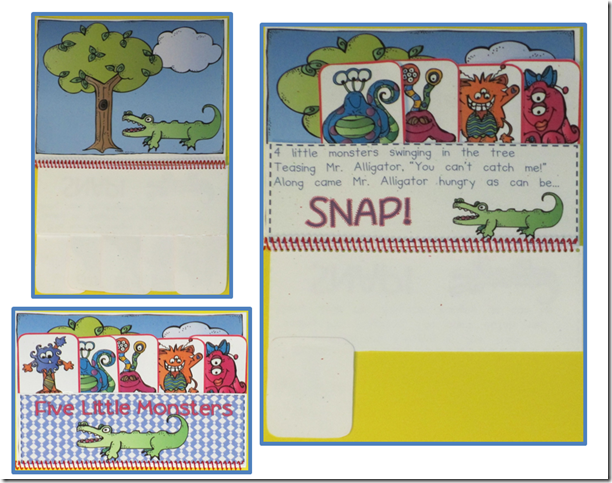 Chalk Talk: A Kindergarten Blog: 5 Little Ducks Interactive Chart and a New Giveaway! 5 Little Ducks Interactive Chart and a New Giveaway! We have been focused on the numbers 1-5 for the last couple of weeks. I have been looking all over for different ways to work on number sense to keep my students engaged and learning, so I was super excited when I found Kim's 5 Little Ducks interactive chart. You can find her original post about this chart here and you can purchase her 5 Little Ducks Interactive Chart and Flip Book here. Kim's interactive chart was perfect because I was also able to use it for a shared reading lesson. I modeled tracking print and pointing to words one to one then had my students take turns using the pointer while we read the rhyme. The kids also loved taking a turn and changing out the numbers and removing a duck. We had fun singing the song, using the interactive chart, and acting out the story. To learn more about using interactive charts in your classroom check out Kim's Interactive Charts post here. 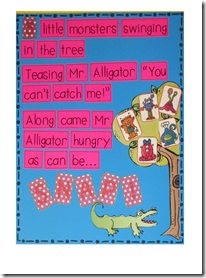 I came across this idea from a TPT freebie called Quack Attack: Shake and Spill. You can find the black and white version here. I adapted the idea by making duck faces and placing them on blue paper. I had my students shake 5 counters in a plastic cup, then dump them. They had to count how many counters landed on the duck and how many landed off of the duck. Then they placed a number card near their counters to show how many counters landed on the duck and how many landed off of the duck. I found this idea from Deanna at Golden Gang Kindergarten. Check out her post 5 Little Ducks Math here. Since we are not working with equations yet, I had my students decompose the number 5 then label the parts with number cards. We worked through all the ways you can make 5 together first. Then I had them use the math sticks to explore decomposing 5 on their own. Now onto the good part!! Kim has updated several of her interactive charts and has graciously agreed to let me give a set away. Yah! We are using the 5 Little Specked Frogs unit today!! Here are Kim's pictures of Kim's charts from her Interactive Charts post. I love the flip books in each unit because my kids enjoy reading them when they finish their work early and during read to self. They are great for counting an retelling. 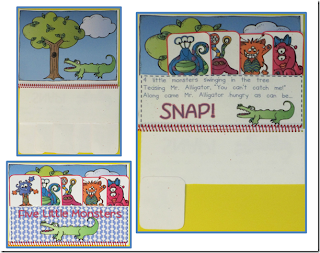 Here is an example of a flip book from her 5 Little Monsters Interactive Chart and Sight Word Reader unit. 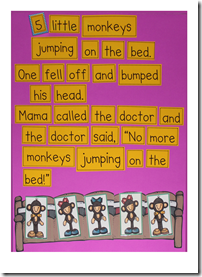 Each of these units also comes with a great small group sight word reader and activity. 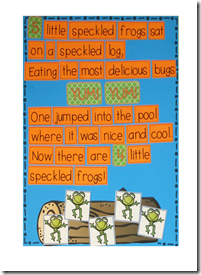 We are going to make words using the 5 Little Frogs sight word reader today. Don't forget your name and email address. The giveaway will end Saturday October 5th at midnight. Good Luck! I will be posting about all of the fun we had using the other interactive charts, flip books, and sight word readers in the next several days. I follow Kim's blog and store. I also follow and enjoy your site. I follow Kim's blog and TPT store. I follow kims tpt store and blog! Thanks! These are in my cart right now. I would love them! Then I can add more treats to my cart! I love these charts. I follow Kim's blog and TpT store. Just wanted to thank you for mentioning me in your blog. You are so sweet and I enjoy following your blog. have a great weekend. I follow all!! I absolutely LOVE all of Kim's stuff!! I follow all of these! I love both your blogs, and actually have these charts on my wishlist on tpt. I follow all and love these! I follow them! Love her stuff, and thanks for sharing how you use them in your classroom! I follow all. April, I so agree that these books about 5 are great to practice numbers 0-5, our focus for Sept and now all of Oct.